There was some controversy surrounding the beginnings of the cemetery which stood on the corner of Morley Road, beside the Gladstone Bridge. The land was presented to the town by a local landowner for the purpose of a public cemetery. A committee was formed consisting of non- conformists and churchmen, but it was reported in the local press that “by some adroit procedure” it was appropriated by the church, despite non conformists forming a majority of the population. This resulted in much bad feeling. At three o’clock on Wednesday, June 15th, 1859, hundreds of people gathered at the new cemetery to witness the consecration of the ground by the Bishop of St. Asaph. The first burial took place later on the same afternoon when the body of William Williams, aged 15 months, son of Joseph Williams, 13, Sussex Street was interred. By the late 1880’s the cemetery was full and no new graves were made, (although some burials continued until the late 1930’s in existing graves). The Rhyl Improvement Commissioners began negotiations to purchase 7.5 acres of land on Dyserth Road for a municipal cemetery, funded by the ratepayers. Thus began another dispute, similar to the one in 1859, between Church and Chapel – the result of which is the “Church Cemetery” and the “Town Cemetery” (Maeshyfryd Cemetery) on opposite sides of Dyserth Road. In 1967/8 Morley Road Cemetery was landscaped. The monumental inscriptions were recorded and indexed, and a plan of the cemetery was made. A Book of Remembrance was subsequently compiled from these records. These are available to view at Rhyl Library, Museum and Arts Centre. 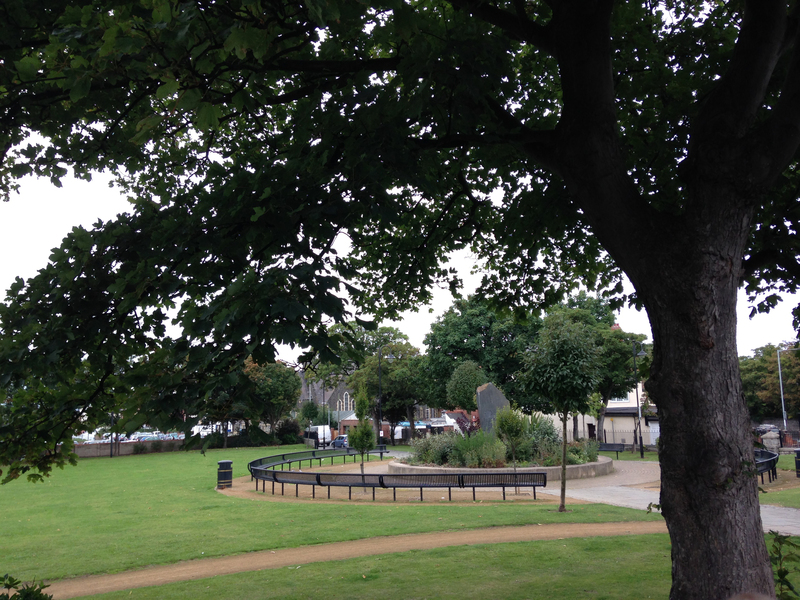 The park was landscaped again in 2006 and was officially opened on May 26th of that year by Rhyl Mayor Cllr. Brian Blakeley and Pauline Dobb of Denbighshire County Council. The garden “aims to provide a pleasant open space for people who live, work and visit the town”. There is now a History Points plaque at the gardens, to read more about History Points click here. The Catholic Church in Rhyl. “Rhyl’s Catholic church, Our Lady of the Assumption (or St. Mary’s, as it is popularly known), is 40 years old in 2015. 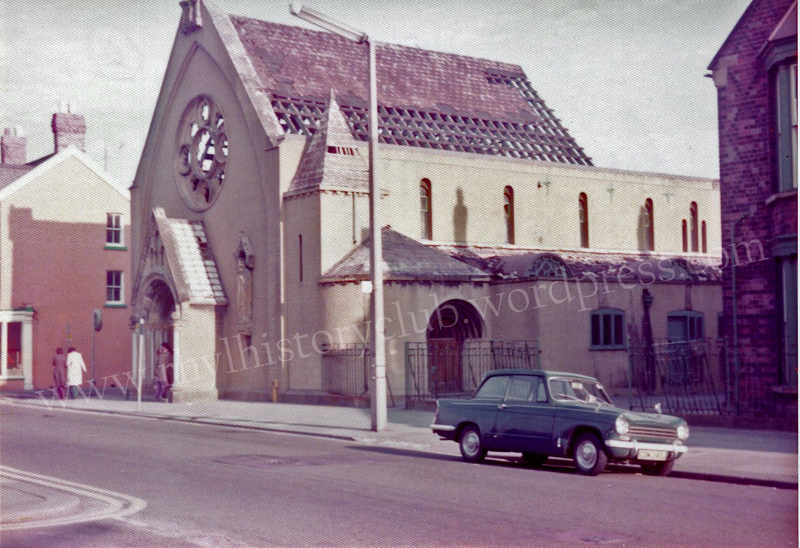 On 21st December 1975, at 12 noon, the final Mass was celebrated in the old church on the corner of Wellington Road and Ffynnongroew Road; and at 4p.m. on the same afternoon, the new church, which had been built immediately behind the old one, was consecrated and officially opened with High Mass by the then Bishop of Menevia, Langton Fox. But the history of the parish and the Catholic community in Rhyl goes back far more than 40 years. Prior to the mid 19th century, Rhyl was nothing more than a little fishing village, a collection of cottages whose spiritual needs had been served since medieval times by the ancient church of St. Mary in Rhuddlan. Rhuddlan was, of course, a Catholic parish before the Reformation but became a parish in the new reformed Church of England and later in the Church in Wales. 1848 was an important year in the history of Rhyl, being the date not only of the opening of the Chester to Holyhead railway which kick-started the town’s growth as a seaside resort, but also of the founding of the Jesuit College of St. Beuno in Tremeirchion. It was the rector of the college, Fr. J. Etheridge, who, in 1851, founded the Mission of Our Lady in Rhyl, the fore-runner of the present Catholic parish. He also founded similar Missions in St. Asaph and Denbigh. The first Masses were said in a public house, Costigan’s Tea Rooms, whose publican, Mr Deardon, was Irish. The early congregations consisted of the landlord and his wife and three Irish railwaymen and their families. As the congregations increased and outgrew Costigan’s, the town’s Assembly Rooms in High Street were rented as a Catholic chapel and school. 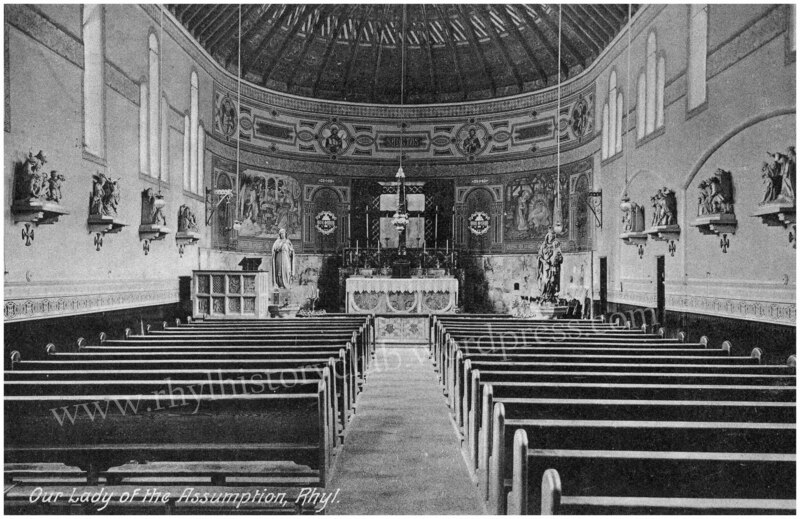 In 1854, land was purchased in Ffynnongroew Road and a chapel designed for a congregation of 150 was built. It is a testament to the the growing Catholic population and to the growing popularity of Rhyl as a holiday resort that this chapel was extended in 1859 but was almost immediately seen to be inadequate for the numbers attending and so a much larger building was planned. A decision to build on the corner of Wellington Road and Ffynnongroew Road was made. An eminent architect, John Hungerford Pollen, was commissioned to design the new church and a local man, Robert Jones, was engaged as the builder. Building work began on New Year’s Day 1863. The first stones were laid on St. David’s Day and the formal laying of the foundation stone took place on March 3rd. In November of the same year the building was completed and in December the church was formally opened in the presence of two bishops. It is interesting to note that the building of this first Catholic church in Rhyl (as opposed to the original little chapel) is almost exactly contemporaneous with the building of St. Thomas’s Church which was completed in 1861. There were at that time 19 churches or chapels of different denominations in Rhyl. That figure says a lot about the way in which the town was expanding in the second half of the nineteenth century and also says much about the overtly Christian nature of society at the time, when church or chapel going was commonplace. In 1865, the Presbytery, the priests’ house, was completed and it still stands on Wellington Road. The old chapel, built in the 1850s, became St. Mary’s Catholic School and was in use until it was replaced by Ysgol Mair on St Margaret’s Drive in the 1950s. In January 1864, The Builder reported that “the total cost of the work (of building the church), exclusive of fittings and organ” was £200. An anonymous history of the parish, written for the centenary of the church in 1963, records that the Jesuit priest from St.Beuno’s in charge of the Rhyl mission at the time was Fr. Wynne, a convert to Catholicism who came from a wealthy and influential non Catholic family. Fr Wynne asked his father for the money; at first he refused, but when he later heard that his son was going round begging to raise money for the new church he relented and paid the money, later becoming a Catholic himself. At the time, the church was much admired and was highly acclaimed in The Architectural Review. The interior was designed to convey the idea of a boat, an ark, gathering souls to salvation and nets were draped around the roof and walls to emphasise this idea. It was very elaborately decorated inside, very much in the Victorian style, with hand painted murals by an unknown Italian artist behind the high altar. There was also a much praised stained glass wheel or rose window depicting the Assumption of Our Lady above the main entrance on Wellington Road. Designed by Pollen himself, it consisted of a central panel depicting the Virgin surrounded by eight smaller panels, each depicting an angel. However, there was much deterioration over time. The highly decorated roof was hidden by beams which were needed to strengthen the structure. The hand painted murals were affected by damp and painted over in 1951. The bell tower became unsafe and was removed in the 1950s. Reports commissioned in the 1960s and 1970s noted that: the choir loft was separating from the main wall; plaster on the walls was in danger of falling on the congregation; there was damp throughout; and the Ffynnongroew Road wall was leaning outwards. So the decision to demolish the church and replace it with the present building was inevitable. Demolition began in 1976. Later that year, the celebrated stained glass window was discovered, almost complete although in a poor state, in the demolition contractor’s yard. Fortunately, it was bought and rescued by The Stained Glass Museum in Ely, Cambridgeshire, where it remains today. Part of it has been restored, although lack of funding means that the rest remains unrestored. One of the smaller panels depicting an angel is on permanent display at Ely; the rest is in storage there, although the whole window was exhibited in a temporary display in 2013 – the first time that the whole window had been on public view since the old church was demolished. The present building was constructed during 1974 and 1975. Designed to be multi-purpose, it consists of four separate units, each forming a square and each topped with a pyramid roof. Moveable partitions mean that there is a flexible and changeable floor plan. One unit is permanently the church area; the other areas can be separate and self-contained or they can become part of the church area. When fully opened out, there is room for a congregation of approximately 1000 people. It was built by Anwyl Builders, Rhyl, to a design by architects Weightman and Bullen of Liverpool. In a letter to the Diocesan Treasurer in 1973, recommending the engagement of consulting engineers, the architects referred to the very difficult sub-soil conditions. The site is apparently the old River Clwyd bed, or at least very close to it; a report from the consulting engineers in 1974 refers to the layers of peat and silt which are prone to settlement under load. Perhaps here is the reason, or one of the reasons, for the deterioration of the old church and its failure to last as long as St. Thomas’s, on the other side of the town. Thousands of gallons of water had to be pumped out before the concrete piles could be inserted into the ground and the steel girders forming the skeleton of the building could be erected. The cost of the new church was over £230,000. It was was a source of considerable satisfaction to the parish when, after years of fund raising, this debt was finally cleared in 1984. • each separate unit has a different shaped pyramid, slated roof. • the central front altar stone comes from the altar in the old church. With the exception of some small pieces of marble and some of the old wooden benches, this is the only bit of the fabric of the old church which survives in the present building. • the top of the altar is a solid stone slab, which is estimated to be at least 320 million years old. • the impressive even alignment of the bricks in the altar screen has often drawn praise from visitors. • the stained glass windows depicting the Stations of the Cross are constructed using a French technique, “dalle de verre”, developed in the 1930s. This involves the shaping of shards of coloured glass into a pattern or picture and glueing them together using a resin. Thicker glass is used than in traditional stained glass, giving deeper colour effects. Many thanks to Rhyl History Club member Dennis Hatfield for contributing this interesting article. Our May meeting consisted of an interesting and informative tour of St. Thomas’ Church by Rhyl History Club stalwart, and bellringer at St Thomas’, Mr. Tony Durcan. One of the highlights of the tour was a visit to the belfry. 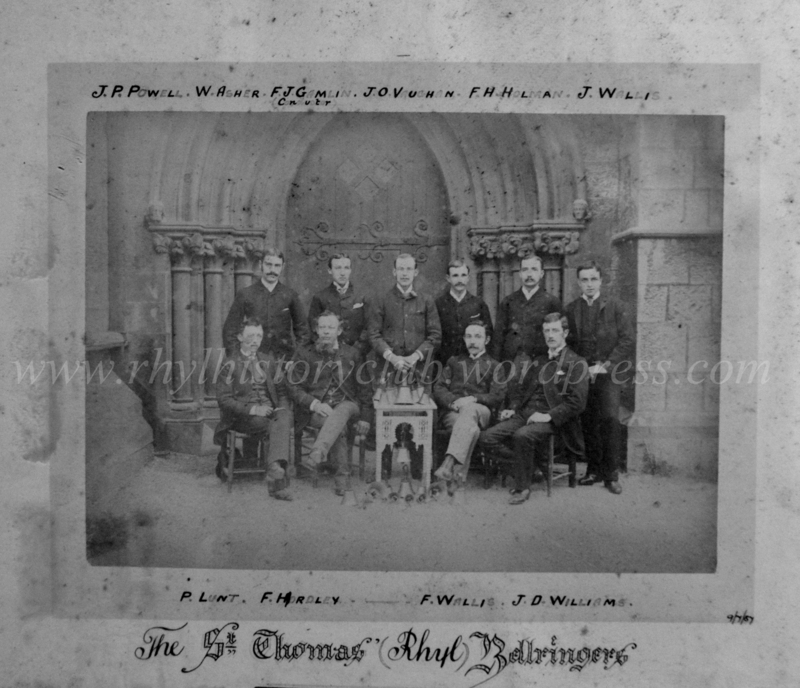 The bells were rung for the first time on December 1st, 1879, the same year that St. Thomas’ Bellringers Society was established. The bells were founded by John Taylor of Loughborough, Leicestershire in 1876. They are a peal of eight bells in the key of F. The Tenor bell weighs 17 cwt (over 863kg), has a diameter of 45.5 inches (1.15 metres) and stands over four foot high (1.2 metres). 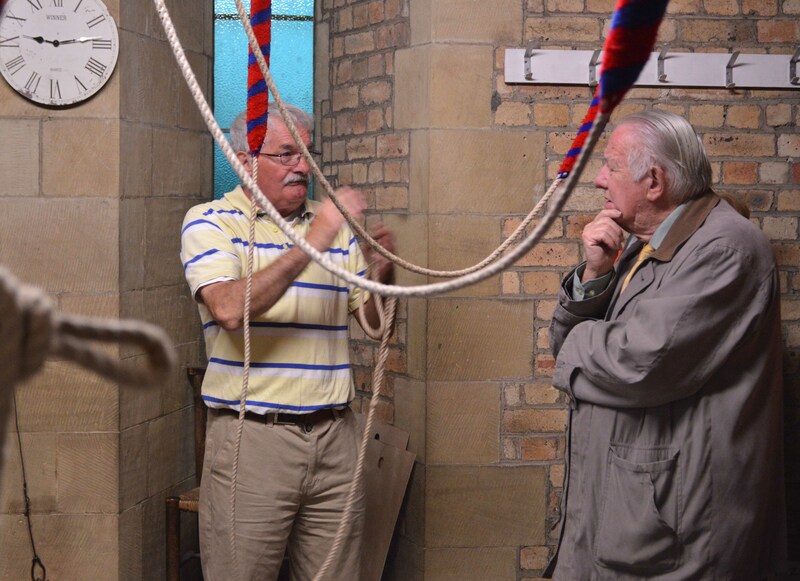 photograph above shows Tony demonstrating the skill of bellringing and explaining the theory to Rhyl History Club Chairman, Mr. Rufus Adams. The belfry currently has eight members, the oldest being 84 years old. 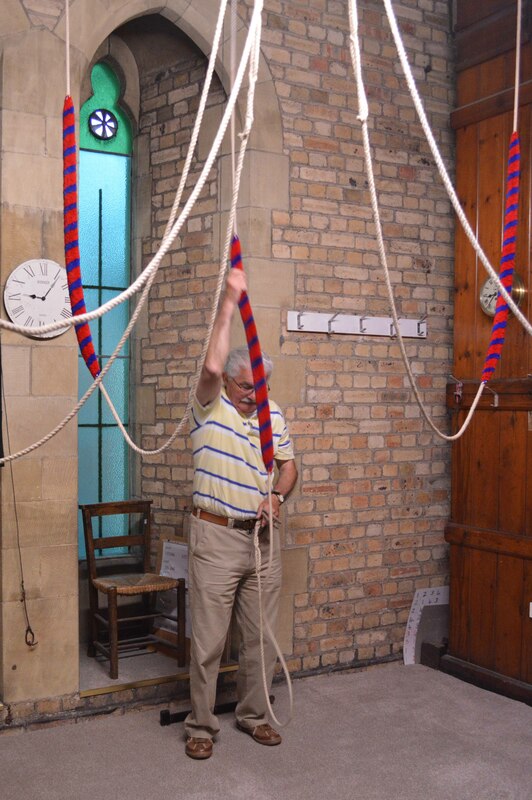 They ring the bells on Sunday mornings before the 11am service. The bells are rung for weddings, they have rung out for Christmas and this year they welcomed in the New Year, 2014. The bells are half muffled when they ring for the dead on Remembrance Sunday. Many thanks to Tony for the above information.